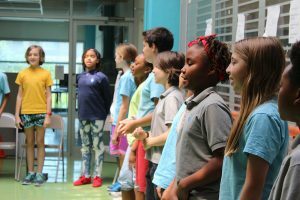 Rapping wasn’t part of their usual curriculum, but the fifth-graders at Two Rivers Public Charter School in Washington, D.C., decided last spring that they were going to learn how to drop a beat … along with a lot of Colonial history. That’s because, at the beginning of the semester, the students discovered a problem. They took home a survey to find out what their parents thought about learning history — and most called it boring. But they also agreed that history is relevant and important. So the students came up with a way to teach history that’s anything but dull. They took some cues from the most popular modern history teacher — the musical Hamilton — and spent weeks researching everything from the French and Indian War to the creation of the Constitution. The students visited museums to see the original founding documents and wrote rap songs in the voices of Colonial characters. “I’m Monsieur Lafayette! / Fu-fighting for the right thing, the freedom and rights of those colonists, / by the ships on the bay, the Brits are in disarray,” fifth-grader Fitz Morrissey rapped during practice one morning with 50 other fifth-graders. This process of inquiry, discovery, and creativity is called an expedition and lies at the heart of the EL Education model, formerly known as Expeditionary Learning. Two Rivers, serving grades pre-K to 8, is one of more than 160 EL schools in 30 states that employ this nearly 25-year-old approach, which emphasizes content, character, and craftsmanship as measures of student achievement. 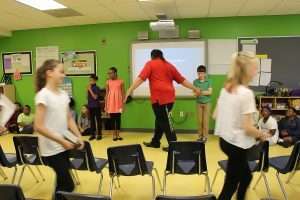 Its teachers and leaders say this form of whole-child, project-based learning is the key to the network’s success across geographies and socioeconomic backgrounds, reaching more than 50,000 students last year, and 1 million in its history. To hear the students talk, the expeditions are almost ritualistic coming-of-age undertakings for each grade. They remember all their past expeditions and nostalgically watch their younger siblings take the same field trips. 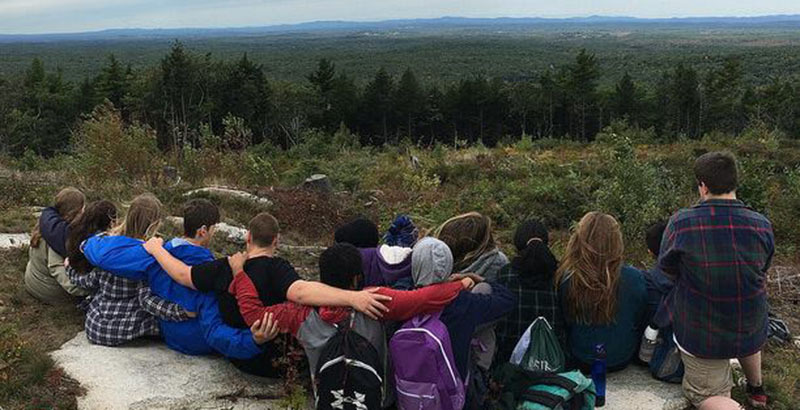 Every year, students embark on two expeditions, each focused on a particular subject area. While teachers have a road map they want their students to follow, the kids have a certain degree of agency and choice in how their group projects — and each student’s role in them — come together. During expeditions, classes may take multiple trips to study their subject, or experts might visit the classroom. For their genetics expedition, for example, the eighth-graders at Two Rivers visited the National Institutes of Health and had lunch with scientists who taught them about gene editing and its ethical implications. But it’s not enough to simply learn about a subject and create a project. EL students are expected to give back to the communities they learn from, so many of the projects are designed as lessons that students can use to share their newfound knowledge. 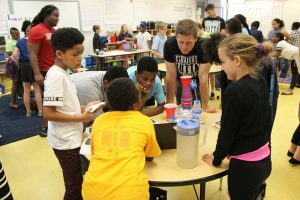 For instance, the eighth-graders created websites to teach their peers about DNA, and fourth-graders hosted an informational fair to educate people about solutions for fixing the polluted Anacostia River. Some EL school projects have even had financial impacts. Ninth-graders at the Springfield Renaissance School in Massachusetts have conducted energy audits on school buildings as part of their expeditions and presented their mayor with reports recommending fixes such as replacing lightbulbs or addressing a continuously running boiler. The suggestions in one report would have saved the city $30,000 each year. Two Rivers eighth-grade English teacher Mo Thomas has taught under several education models and said the real-world applications of EL’s project-based learning generate significant student engagement. The EL Education model was born in 1991, when the Harvard Graduate School of Education and Outward Bound submitted an application to the just-launched New American Schools grant program. Their proposal, for a model that would merge various reform efforts surrounding curriculum or scheduling into one school design, was one of only 11 selected for the grants to help turn around low-performing schools, Berger said. Since then, the EL network has grown to include 165 schools, covering grades pre-K to 12. Some 60 percent of the schools are in urban environments, 17 percent in rural, 16 percent in suburban, and 7 percent in “towns,” the network reports. About half are operated by districts and the other half by charters, with a small percentage of independently run schools. Its students are 44 percent white, 26 percent Hispanic and 24 percent black. It’s not easy to become an EL school, and the founders are the first to acknowledge the long process. It starts with an on-site staff meeting with a school that wants to transition to the model, to judge the level of interest. Although EL CEO Scott Hartl said the organization is most interested in working with underperforming schools, that first step “leads to a ‘no’ or a ‘not yet’ with far more schools than it leads to a ‘yes.’ ” Even after getting the go-ahead, a school may be considered EL in name, but it takes four to five years of continued evaluation and goal-setting before it’s a credentialed EL school. “We can’t create 300 great schools quickly. It’s really hard to have 150 schools,” Berger said. That’s why part of EL’s growth plan focuses on spreading a free literacy curriculum that its teachers have developed, which has been downloaded more than 8 million times. It also hosts a vault of videos on its website showcasing student work for other schools to view and model. “I’ve never seen a moment where we at EL have had more of an opportunity to contribute to kids and teachers than I see now,” Hartl said. While the EL model is certainly engaging for students, there’s a tension between going deep into a subject area versus giving students a large swath of knowledge that will prepare them for exams. Though Two Rivers does some test prep, Thomas said, students recognize that they might not have covered all the science standards by the time the test comes around. “We had students say, ‘You teach us to solve problems, so we’ll figure it out,’ ” she said. Because the entire school is designed this way, said fifth-grade teacher Julia Tomasko, teachers don’t feel pressured to cover all the content by test time. “Our school has decided to prioritize that kids might not learn every single fact, but they’re going to have a deep subject area [knowledge],” she said. 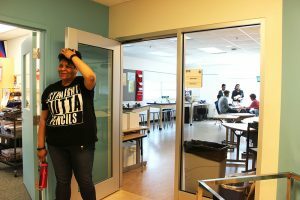 The students at Two Rivers scored 40 percent proficient in math and 41 percent proficient in English on the 2016–17 PARCC results, compared with 27 percent and 31 percent, respectively, for D.C. students as a whole. 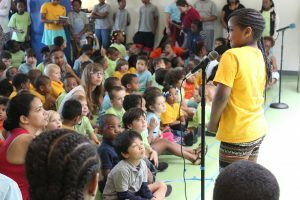 The D.C. education department classifies Two Rivers as a “rising,” or good, school, and the district’s charter school board calls it a Tier 1 school, with a 67 percent score. Even if students don’t know all the content for tests, research shows this deep learning produces good outcomes. The American Institute for Research studied 20 high schools with diverse populations — including EL schools — that were part of networks using deeper learning models. Their reports, funded by the William and Flora Hewlett Foundation, found that graduation rates were 8 percentage points higher and four-year college attendance rates were 4 percentage points higher for students who entered these high schools in ninth grade. The research didn’t show the schools having an effect on self-management or persistence, which Zeiser said shows that trying to instill these skills starting in high school doesn’t acknowledge the long-term, external factors required to teach social-emotional skills. A 2013 Mathematica Policy Research study commissioned by EL Education looked at five sample schools and found that after two years in an EL environment, students gained an extra five months of learning growth in reading and two months in math. This deep learning can be easily differentiated for student learning levels, which Thomas said allows kids to do complex assignments they had once been considered incapable of completing because they lacked reading skills. Two Rivers executive assistant Laura Sparks recalled working with a first-grader who hadn’t mastered basic letters and sounds but was able to give a presentation on spiders “with authority” by using art, movement, song, and video. “When you think about the achievement gap between low-income and high-income kids and the amount of access to materials and knowledge, EL is about deep knowledge, so it eliminates ‘I’ve read 20 more books than you,’ ” Sparks said. 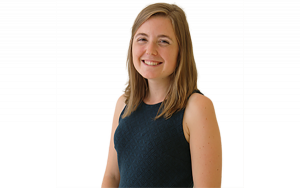 Still, rural students may find some deeper learning models challenging, Zeiser pointed out, as they lack access to the internships or extensive field trips that are available to students in cities with museums and researchers. In these instances, technology like virtual reality might have to fill a role in connecting students to places not easily accessible. It’s the Friday before Showcase night, when students present their expeditions to parents and community members. Kids are practicing speeches, twisting nervous hands around note cards, and fidgeting with their final projects that will be presented the following Monday. The fourth-graders have been studying the Anacostia River all semester, trying to come up with solutions to help manage the pollution in the water. Now, models of those solutions — such as a popsicle stick house with a roof of grass — are standing on circular tables, surrounded by educational brochures written by the students. As their older peers walk by, students share their presentations. “You have good evidence, but try to be more confident,” an older student told two of the presenters. This criticism is part of the culture of craftsmanship and character that EL tries to instill. “Once a child finishes her schooling and enters her adult life … for the rest of her life she will not be judged by test scores. She will be judged by the quality of work that she does and the quality of person that she is,” Berger said. From a young age, students are taught to critique their schoolmates’ work using guidelines of being kind, specific, and helpful. It’s not always an easy thing for students to give and take, teachers say, but criticism is something they’re going to face in college and careers. The EL model emphasizes multiple revisions to achieve a high-quality product. The history raps created by the fifth-graders, for example, were revised four times before they reached their final lyrical genius. And if the applause ringing through the common space after the dress rehearsal was any gauge, their expedition was a success.